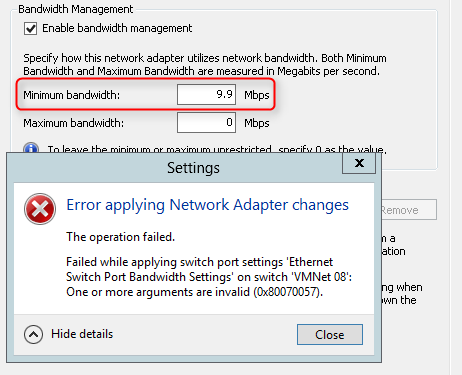 When I apply "Minimum bandwidth" of "Network Adapter" which is below 10 Mbps, I found an error message. The "Minimum bandwidth" bases on the maximum bandwidth of physical NICs. 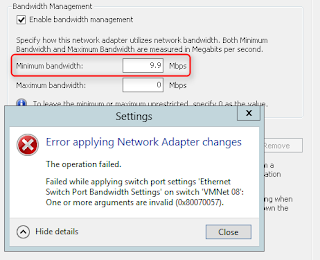 For example, My Hyper-V server was installed the 1 Gbps NIC so the minimum unit is 1% (10 Mbps) of Maximum bandwidth of the physical NIC. Although private virtual switches don't connect to the physical NICs. It is also affected. "The minimum unit is 1% of the link capacity. 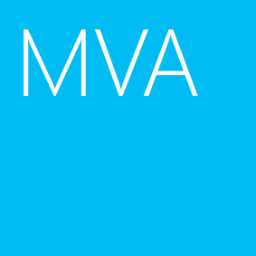 For example, if a Hyper-V Virtual Switch is connected to a 10 GB NIC, the minimum amount of bandwidth that you can allocate to a virtual network adapter connected to the switch is 100 MBPS." so the minimum bandwidth for the 1GB NIC would be 10 Mbps. I am going to update the contents.